Travel along the beautiful suburbs of the Atlantic, traverse the spectacular Chapman's Peak pass, and explore the tip of Africa at Cape Point Nature Reserve. Visit the penguin colony at Boulders Beach and make your way along the beautiful views and suburbs of False Bay on the Indian Ocean. Finally, stroll through the rich plant life of Kirstenbosch Botanicle Gardens on the slopes of Table Mountain. Taste some of South Africa's finest wines in the beautiful Cape Wine Region. Lunch at one of the many classic, award-winning restaurants. and explore the rich history and culture of towns such as Stellenbosch and gastronomic Franschhoek. Visit the historic prison of Robben Island, which for some 450 years incarcerated convicts, and political prisoners including -Nelson Mandela. Ride the revolving cable car for a bird's-eye view of Cape Town and the Peninsula from the top of the iconic Table Mountain. Explore the rich history and culture of Cape Town including Company Gardens, Castle of Good Hope, Grande Parade and the District Six Museum. Take in the natural sights and sounds of the Cape as you hike up Table Mountain and explore its summit. Glimpse the indigenous fynbos flora of the Cape Floral Kingdom, the smallest but richest of the world's six plant kingdoms, with some 8 600 flowering species. Spot birds and small mammals and lunch while absorbing the breath-taking beauty of the Peninsula and the colourful city far below. With some of the best whale watching in the world, this boat based tour is not to be missed. Spot many coastal birds and other marine life at Dyer Island and on your boat cruise, possibly including great white sharks and southern right whales. Spot southern right whales and sea birds from the magnificent cliff paths of Hermanus. Lunch at popular seafood restaurant. Visit the historic prison of Robben Island, which for some 450 years incarcerated convicts, slaves, exiled Eastern princes, lepers, the insane and political prisoners including Nelson Mandela. Absorb the rich history and culture of the prison, now a World Heritage Site. Travel around the island, with breath-taking views of across the bay. Board a boat at daybreak to search for the ocean's elusive super-predator - the great white shark ! These operators have studied Great Whites since 1989 and have produced many acclaimed wildlife documentaries showcasing the incredibly rare behaviour of breaching (launching themselves out of the water) in pursuit of prey - most commonly Cape Fur Seals. Visit the historic prison of Robben Island, which for some 450 years incarcerated convicts and political prisoners including Nelson Mandela. Explore the rich history and culture of the local townships. Meet an inspiring resident, Vivian Zilo, and visit her community programme, dedicated to uplifting the lives of the local people. 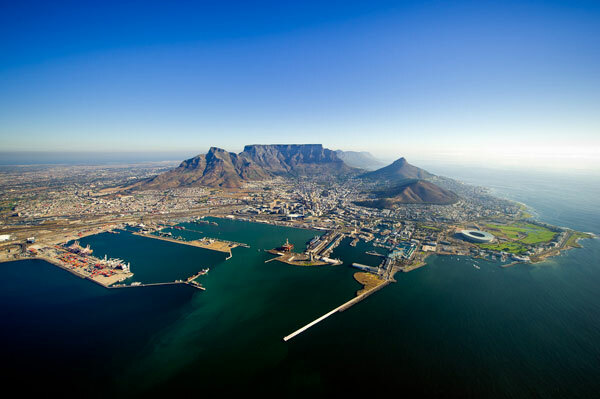 Ride the revolving cable car for bird's-eye views of Cape Town and Peninsula from the top of the iconic Table Mountain (weather permitting). Explore the rich history and culture of Cape Town including Company Gardens and the South African Museum. Haggle in the colourful and bustling market of Greenmarket Square. View the historical impact of racial segregation during the Apartheid era. Explore the rich history and culture of the local townships. Meet an inspiring resident, Vivian Zilo and visit her community programme, dedicated to uplifting the lives of the local people.